This delicious summer drink is prepared over two fragrant, flower-filled days. It makes approx 2.5 litres. Take 20 or so elderflower heads with thick stalks removed, add a handful of rose petals (I used a mix of wild roses with some fragrant garden ones), seven sprigs of lavender, two sliced lemons and two handfuls of wild or cultivated strawberries. Meanwhile, add 1.3 kg sugar to 1.8 kg just boiled water in a big bowl. Stir to dissolve, creating syrupy water. Add all ingredients to the bowl of syrupy water, cover with a cloth and leave for 24 hours. Strain mixture through a clean muslin cloth or old clean pillow case. Squeeze well to extract the juice. Pour the fragrant cordial into bottles. Drink diluted with water. Delicious! Also goes well with sparkling water, tonic water or even ginger ale. Feel free to vary the flowers and fruit according to what you can find. That’s all part of the fun. Magical and irrational as this may sound, I first learned how to make crystal and flower essences through a series of dreams. The first ones happened while I was qualifying as a healer, around 2003. In that hypnogogic state between sleeping and waking I was shown, step by step, how to go to particular plants in the garden and gather small amounts for the purpose of bottling their essential signature. I was shown how these essences could then, at a later date, remind us of essential qualities within ourselves. The garden around the Studio is semi-wild, with native trees and plants co-existing with introduced specimens. There’s a fusion here of what will never be tamed, and what is cultivated. I believe that humans are very like that: each of us is a unique blend of wild and cultivated. Plant essences can help us to get this balance right within ourselves. The crystal essence dreams came along a little later, after those early plant essence dreams. The most vivid perhaps was the time I was given, while dreaming, a vial of angel essence, with implicit instructions on how to make my own through a blend of crystals, rose oil and rose water. The crystal dreams suggested to me that while the plant essences addressed the emotions that constantly occupy us, the crystals themselves addressed bedrock aspects of who we are. Furthermore, the weather and time of day or night also had an input. From time to time I share the garden with other people who’d like to make their own essences. One such event is happening here on Sunday 17th July, during an event I’m co-hosting with Jennie Meek, who will be bringing her own expertise of Qi Gong and therapeutic tapping to share. You can find out more here. How do crystal and flower essences work? I do like logical explanations and I am respectful of the scientific principle of finding proof of efficacy. At the same time, I’m happy to find therapy in the process of making. The essences are similar to homeopathy in that they carry little or no aspect of the original material. One explanation that is sometimes suggested is that water has memory – it records the essential signature of a material added to it. It may also be that the recording is better when the person creating it has uncluttered, open, focused intention. If any scientists reading this find that explanation hard to swallow, I think it’s possible, very simply, that on a conscious or even sub-conscious level, qualities of the original plant or crystal remind us of qualities within ourselves, and help us to reinforce those helpful, positive aspects. The bottom line is that when we make an essence with intention, and then take small amounts of it afterwards – either in drops to imbibe, or in fragranced droplets to spray around us – a subtle yet delightful emotional shift happens within us. Dr Edward Bach recognised this when he first made his flower remedies, back in the 1930s, and it’s possible to recognise the exact same thing today. In late spring there’s a plentiful blossom in the hedgerows that makes a wonderful, health-giving tea. 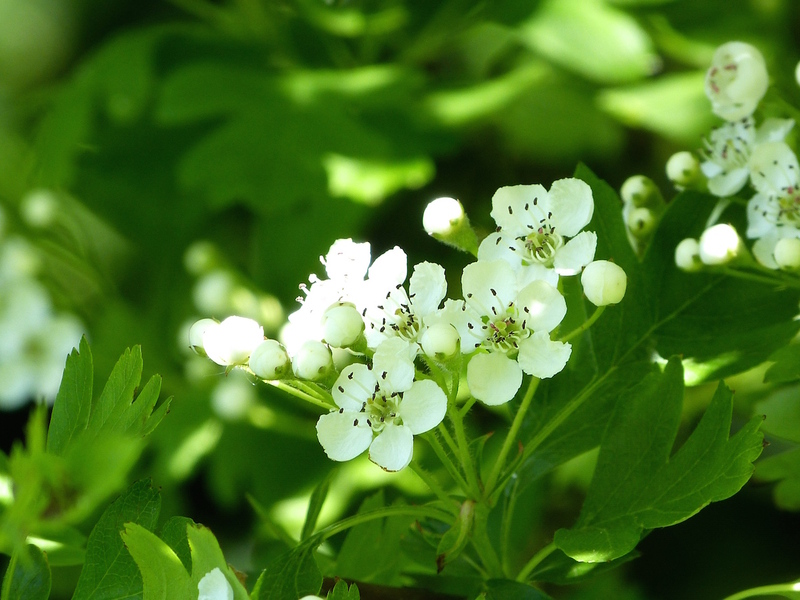 Hawthorn blossom and leaves alike are good for all aspects of the heart. Rich in tannins and bioflavonoids, it’s a great alternative to green tea. But harvest it wrongly, and you may never want to touch it again. Hawthorn fragrance is an intriguing mix of sweet and… well, not so sweet. When it’s ultra-fresh, the sweetness prevails. When it’s wilted, there’s a lingering whiff of something rank. And yet when hawthorn has completely dried, it becomes again a delightful, drinkable tea – rather like a lightly fermented green China tea. Simply collecting the blossoms on a dappled sunlit day is therapy in itself. I like to follow Lucinda Warner of Whispering Earth’s advice and pick miniature sprigs of young flowers surrounded by a few leaves. You have to watch out for the thorns, but they’re easy to avoid. A single fresh sprig, plucked straight from the tree, makes a lovely cup of tea for one. Place one fresh sprig in a cup of boiled water, and brew for a few minutes. It’s fun to drink while the sprig is still in the cup. If wished, add a squeeze of lemon and a small teaspoon of honey – delicious! 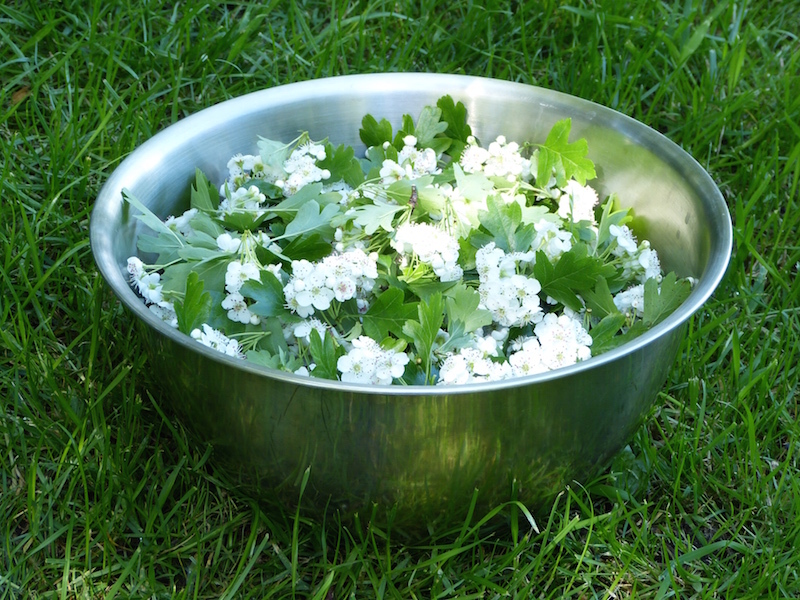 Place your sprigs of hawthorn blossom complete with their leaves on a tray in a well-ventilated place to dry. Cover with paper if you need to protect your harvest. Sometimes I simply place them so they can lie in a single layer inside a large paper bag, then leave them on a shelf in a warm and airy place. If you have a dehydrator, you can speed up the process dramatically and produce dried sprigs on a gentle setting in just a few hours. To drink, place one to three dried sprigs in a tea filter, inside a cup of boiled water, and brew for a few minutes. Remove filter and enjoy. 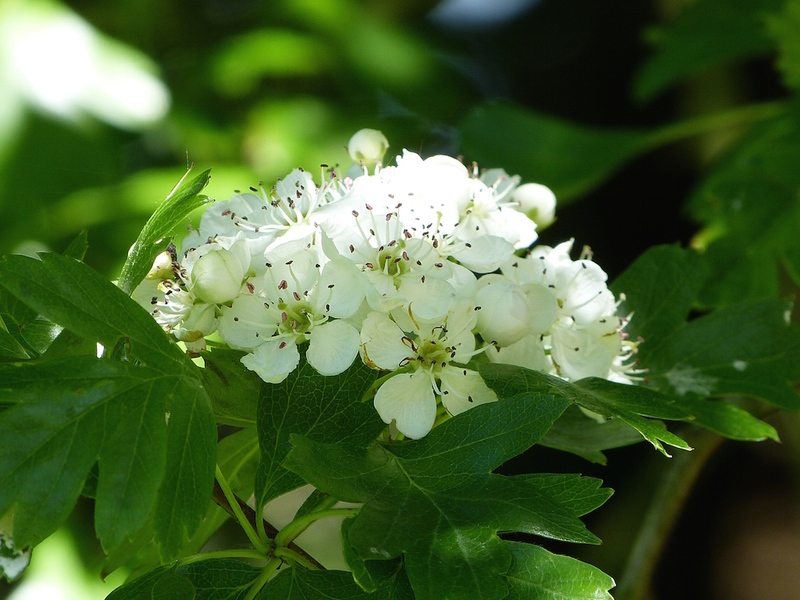 Hawthorn blossom, leaves and berries have all been long used as a tonic for the heart, helping with irregular heart beats, tiredness associated with poor heart function, and lowering of blood pressure. It’s also helpful for the whole circulatory system. And it’s been used as a tonic for the emotional heart, helping alleviate anxiety and bring calm. The feeling after drinking is as if your heart is basking in a warm, reassuring glow of wellbeing – that’s how it always feels to me. Herbalist Nina Nissen suggests that it’s best drunk daily in small dosages over a period of 2-3 months, but it can safely be taken continuously if required. 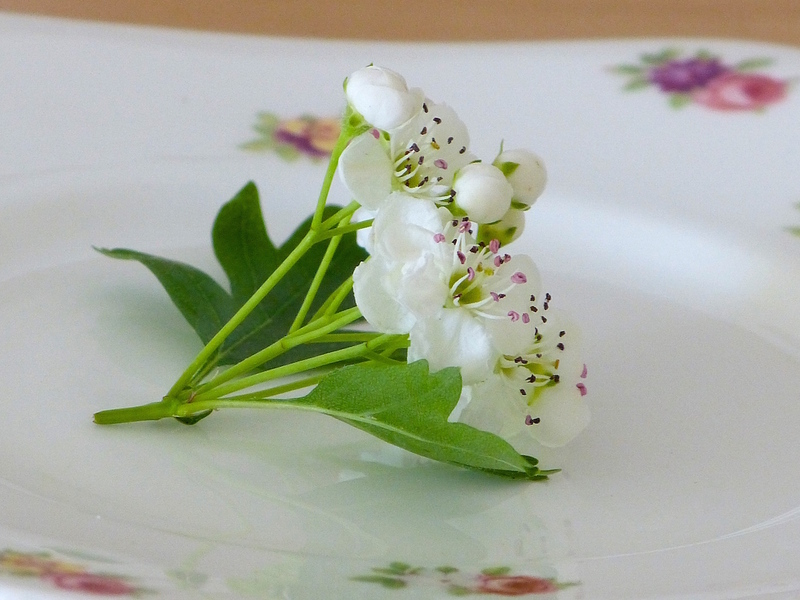 If you are taking other medicines, check with your doctor before drinking hawthorn infusions. Hawthorn, a member of the rose family, has been viewed as a sacred medicinal plant for millennia. It’s a plant of many dimensions, endlessly fascinating to those who take the time to hear its teachings. The blossom is a wise and beautiful addition to any tea collection – and it’s free. 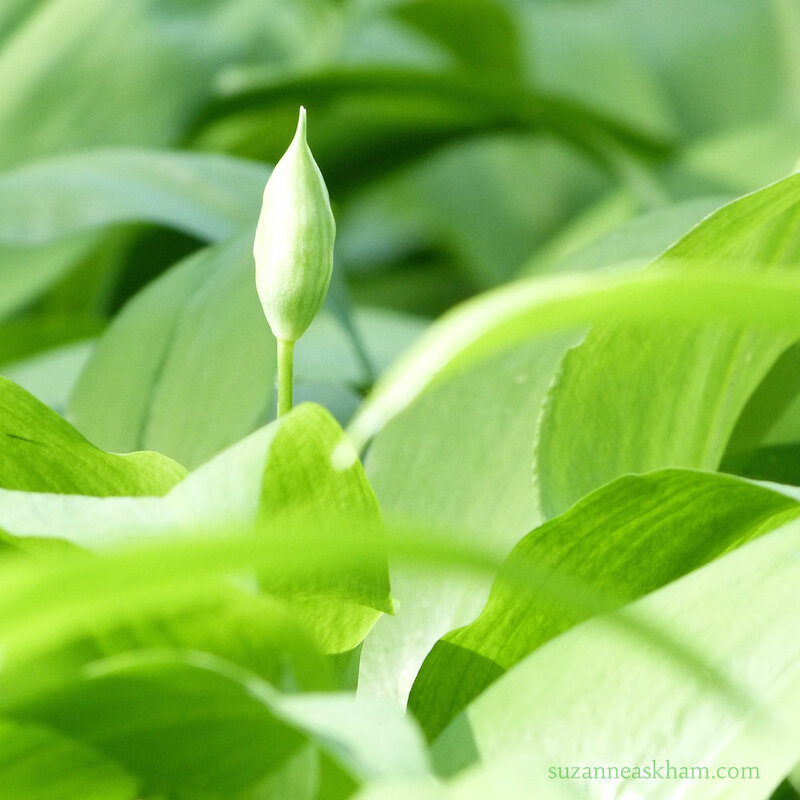 Wild garlic grows in vast, natural fields in damp woodlands in the spring. It’s just waiting for you to harvest it and if the buds are looking like this one above, the perfect time to harvest is right now. Here are some guidelines for you. 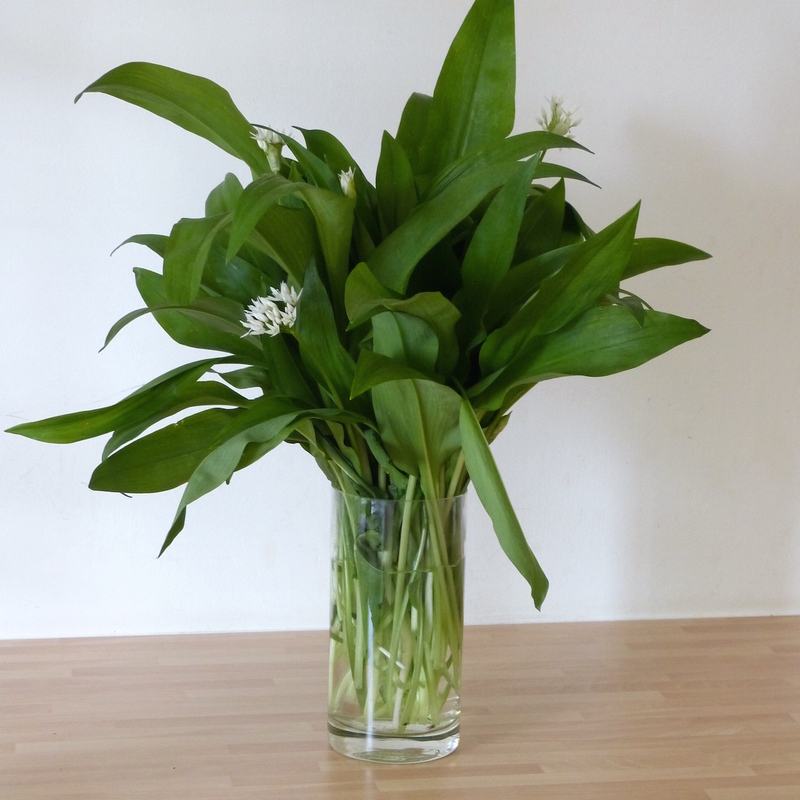 Wild garlic, or Allium ursinum, has long very pale green stems. Its leaves are arrowhead-shaped, one per stem. Its buds grow one per stem, and opens out into a loose tuft of pretty white flowers. Every part of the flower has a pungent garlicky fragrance which is best experienced by crushing a leaf lightly between your fingers. There are two toxic plants that must never be confused with wild garlic. Lily of the valley has similar leaves but purple stems, and its flowers grow in a long spray. Lord and Ladies, an arum, has different shaped leaves but grows among the wild garlic and could be scooped up by an over-hasty picker. One spring I went out with relatives and we all went a bit crazy, picking as much garlic as we could carry. Of course it was next to impossible to process all that food, and I’m sorry to say some of the surplus ended up in the compost. It’s a plant that is best eaten fresh, so just gather what you need. If you’re intending to cook wild garlic as a side dish, 20 leaves per person makes a generous portion. The stems have a more delicate taste and pleasant texture, so be sure to collect them as well as the green leaves. Don’t unearth the bulbs which are very small. The goodness we want is in the aerial part of the plant: the part above the ground. It will keep for two or three days in your kitchen, either in a loose bag in the fridge, or in water as shown here. Wash, chop roughly and add in small quantities to salads. The open flowers can also be added to salads, contributing beauty and an amazing peppery taste. There are many recipes on the internet. My favourites don’t copy the classic basil pesto, but blend ingredients that perfectly suit garlic’s distinctive taste. This is a great example by Hugh Fearnley Whittingstall. Blend 50 g of lightly toasted and cooled walnuts in a food processor with around 75 g of washed and chopped garlic leaves, 35 g parmesan cheese, finely grated zest and juice from half an unwaxed lemon and around 130 ml of olive oil. Add sea salt and black pepper to taste. Spoon into a clean empty jar, and store in the fridge. It will keep for several days, but probably won’t last that long – too yummy! Mix it with pasta or spread on crisp bread. 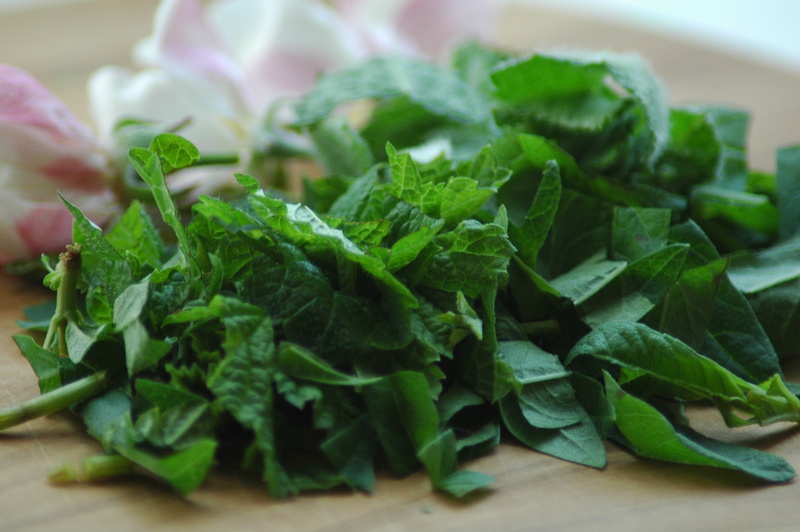 Wash and roughly chop leaves and stems, and simmer for a few minutes in a little water until soft and wilted. Make sure the pan doesn’t boil dry. The flavour when cooked is remarkably mild, making it a perfect spring vegetable. You can also add the washed, chopped leaves to a casserole for the last few minutes of cooking. You can create a soup with onion, a little potato, and lots of wild garlic with seasoning and a swirl of cream. Or you can simply add a single raw garlic bud to the centre of any soup as a peppery garnish. 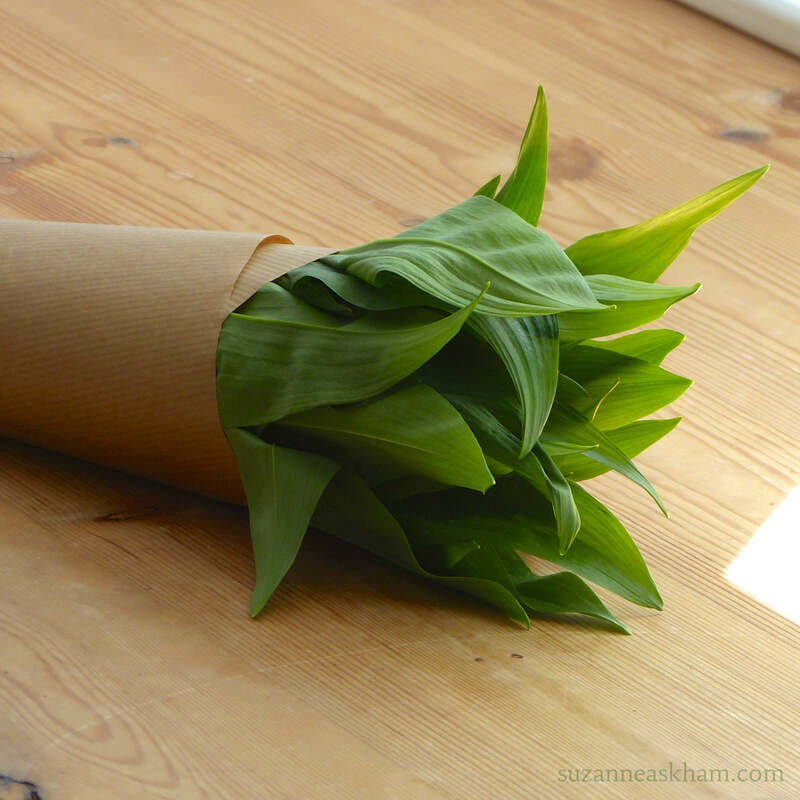 Wrap some wild garlic up in some brown paper and write some simple instructions on the paper. As gifts go, it’s a definite talking point, and you may even be introducing someone to a great spring ingredient. 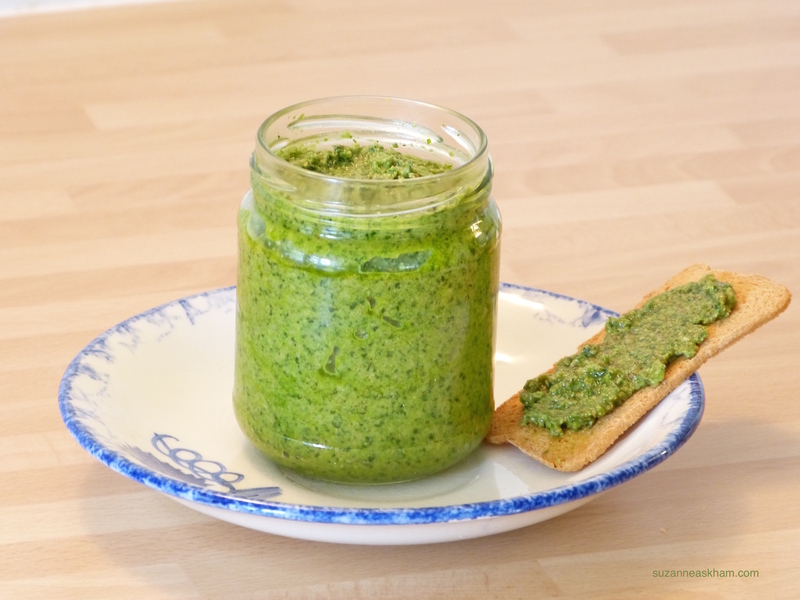 A jar of wild garlic pesto is another great foodie gift. Wild garlic is antibacterial and antiviral, and of all the allium family it is particularly good at lowering blood pressure. So it’s helpful for your immunity and your heart. 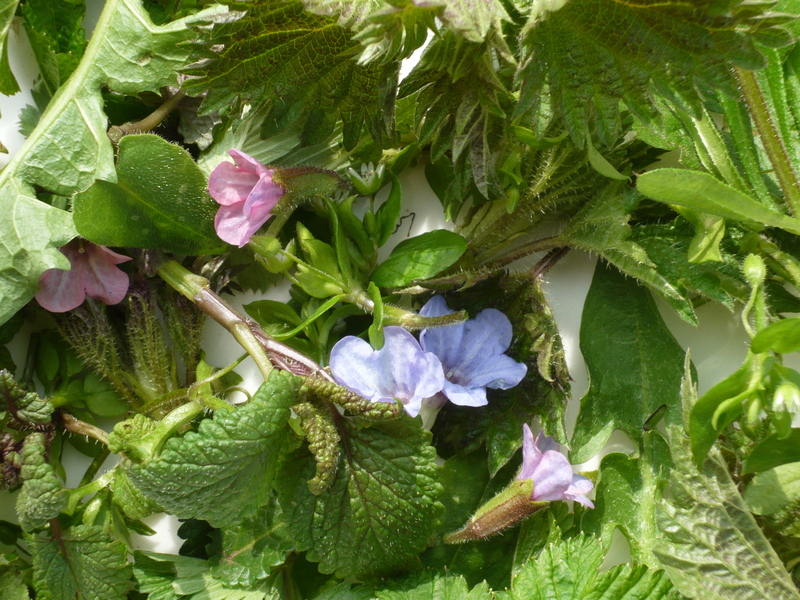 Balm, Chickweed, Dandelion, Nettle, Wild Strawberry, Blackcurrant and Lungwort make a fabulous spring tea. Nature plays a huge, much loved part in the meditation activities here in the Studio. But did you know that all year round at the Studio, I harvest from nature to make culinary dishes, herbal teas, flower and fruit cordials, natural skincare products, and a host of other lovely products? But from next week onwards, I’m offering regular hands-on naturecraft sessions here in North Wiltshire. We’ll be based at the Studio, but we’ll also go out into the neighbouring countryside, so bring your wellies! You’ll be able to make your own natural skincare products, eat yummy wild foraged dishes and drinks, and even do some creative willow weaving. Naturecraft sessions will often be arranged at fairly short notice to catch harvests at their very best. I hope you’ll join me soon at a naturecraft session. After all, we all need to know the difference between inedible lily of the valley and yummy wild garlic! And of course, I’ll be including more naturecraft blog posts over the coming seasons, to share with you wherever you live. If I had to choose one herbal tea to drink for the rest of my life, I would probably choose lemon verbena, also known as Aloysia citrodora. When you brew it strong, it’s zingy, health-enhancing liquid sherbet in a cup: a light and warming drink that lifts the spirits unlike any other. When you brew it weaker, it is a delicate, uplifting citrus-scented beverage. But there is a catch: it has to be harvested and stored with love and respect. If you find a bargain packet of 20 lemon verbena tea bags, walk on by. The aromatic oils will not be present. Without them, you are left with dried and empty leaves. I first discovered the magic of lemon verbena when travelling with my family through Northern France, eight years ago. We stayed in a guest house with big, bare rooms and botanical books on the shelves. We arrived late, and slept soundly between crisp white cotton sheets. At breakfast the next day, the herbal tea on offer was verveine, which I knew was the French name for this popular tisane. So I asked for verveine. It arrived as a small twig of dried leaves in a pot. The fragrance was heavenly. I was already falling under its spell. When I drank the brew, I tasted a zingy, lemony lightness. The flavour was so vibrant. It seemed extraordinary that so much could be packed into a small, dried sprig. The next time I asked for verveine, in an Alpine resort, it had been made with a tea bag, and was a dull disappointment. I discovered then that processing destroys this herb. Back home, I tried ordering loose leaves from herbal suppliers, but they were never as lemony as that first, fragrant brew. So I experimented with harvesting my own. 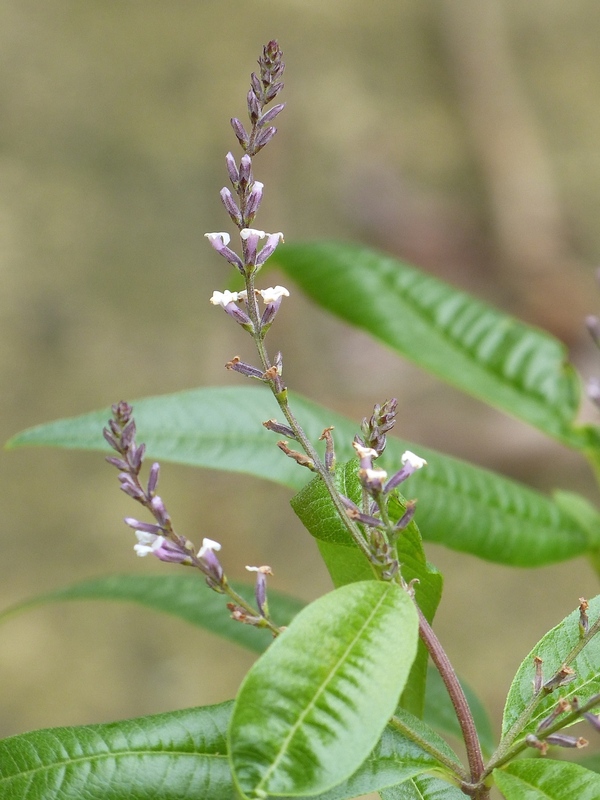 My parents had actually been growing an Aloysia citrodora in their greenhouse for years. My mother put a few leaves at the bottom of cake tins for a subtle zingy additions to her bakes. But no one was making tea with it. So I started harvesting their surplus. I made the tea with fresh leaves, four or five chopped roughly per cup. I dried many of the leaves for winter use, as the plant dies down in colder weather. And so I continued for several years. Nowadays I still harvest from my parents’ greenhouse plant. But recently I bought a plant of my own from Foxley Road Nurseries near Malmesbury in Wiltshire, UK. Co-owner Carol Hinwood is a huge fan of lemon verbena tea, and always keeps a good stock of plants there. All summer long my new Aloysia citrodora has been sitting in my front yard, soaking up the sunshine in a large earthenware pot. It grows quickly, and has even flowered profusely with tiny, fragrant blooms. I cut a stalk at a time, put it in water indoors, and use it successively for three or four cups of tea. It is just beautiful. Before the weather gets too wintry, I will bring it into a cool garden room, to protect it from frost. 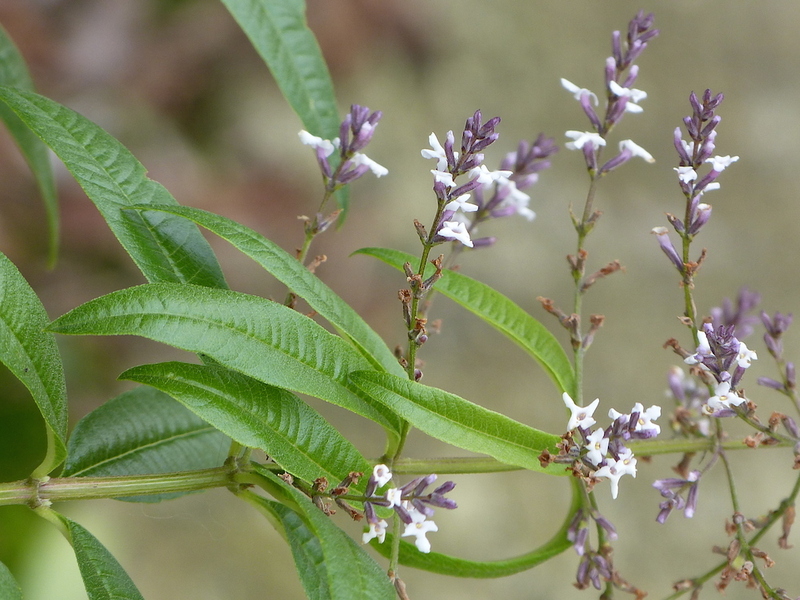 The essential oil in lemon verbena is uplifting, de-stressing and relaxing. The plant has anti-viral and anti-fungal properties – studies have shown it to be effective against Candida albicans, or thrush. 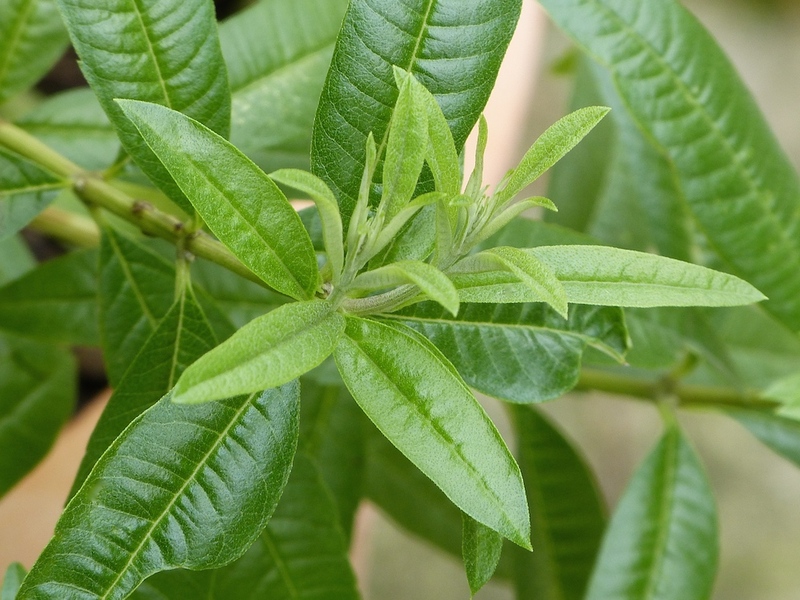 Lemon verbena is also rich in youth-promoting anti-oxidants. The meditators who come to my studio love it, finding it both peaceful and refreshing. First, locate your nearest lemon verbena plant. You may be lucky and know someone who is already growing it. If not, herb nurseries should have young plants available. It can’t cope with frost, so plant it in a large pot in a sunny spot, and bring it into a cool indoor space in the winter. Or grow it in a greenhouse. Harvest the leaves by pruning the plant when the stalks are around 25 cm or longer. Cut the stalks fairly low down with scissors or secateurs. Roughly chop four to six leaves and place in an infuser, in a cup, preferably covered. Leave to steep for five minutes. Then strain the leaves and drink the resulting, fragrant infusion. Dry the leaves by hanging the stems upside down in a large paper bag in a warm space for a few days or weeks until completely dry – the stalks should snap when you try to bend them. You may put them in a jar or bag as they are, or crumple them slightly, to fit more into your jar. I generally remove the leaves from the stalks (easy to do) and just store the leaves. Other people keep the stalks. Either way seems to keep the all-important essential oils intact. Put an air-tight lid on your jar, and store in a cool, dark cupboard. When you are ready to drink the tea, take a few dried leaves, or about one teaspoon of the crumpled herb, and steep in a cup, preferably covered, for five minutes. Strain and drink! If you are seriously into herbs, as I am, it’s worth investing in a dehydrator. I use an Excalibur that I’ve had for many years. In this case, I take the fresh leaves off the stalks, discard the stalks, and place the leaves on trays in the dehydrator. I dry at a setting of around 45ºC or 115ºF for a couple of hours or so until the leaves are crispy dry. (It’s wise to keep an eye on them. At times I have over-dried and lost some of the essential oils.) Then I place them in a jar, as before. I believe that to make your herbal tea from nature is to connect with your own true nature. And the nature of lemon verbena is one that’s truly worth connecting with: happy, vibrant, healthy and serene… and absolutely fragrant. PS For a refreshing summer health drink, simply pop one or two leaves of fresh lemon verbena into a glass of cool water. The herb infuses the water with a deliciously light citrus note. 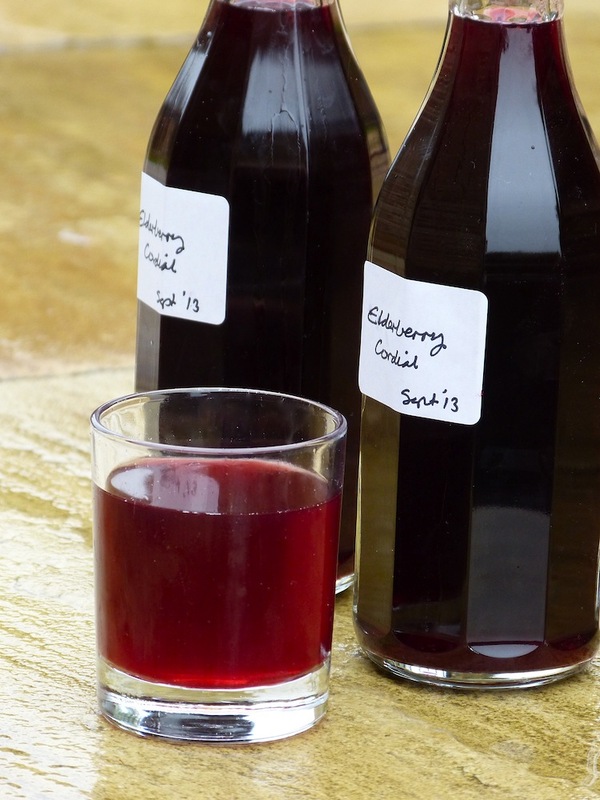 If you’re looking for a reason to love autumn, I give you… elderberry cordial. Imagine a sublime concentration of juicy, fruity, fresh and vibrant flavours. Picture the deepest, richest ruby red colour. And did I mention that it’s backed with health benefits? It’s full of antioxidants and bioflavanoids. Rich in vitamins A, B6 and C, it also has good amounts of iron and potassium, making it a healthy drink all winter long. Okay, it contains sugar. But you do dilute it. Elderberry cordial is just beautiful. My friend Jacqui asked me for the recipe, and I realised I don’t have one, not really. It’s flung together according to what fruits are available. I have been known to throw blackberries and plums into the mix, and any number of citrus fruits. But this year, for the first time, I have written it down, just for Jacqui… and also for you, if you are passing a harvest-ready hedgerow any time soon. Please note: measurements do not have to be exact. 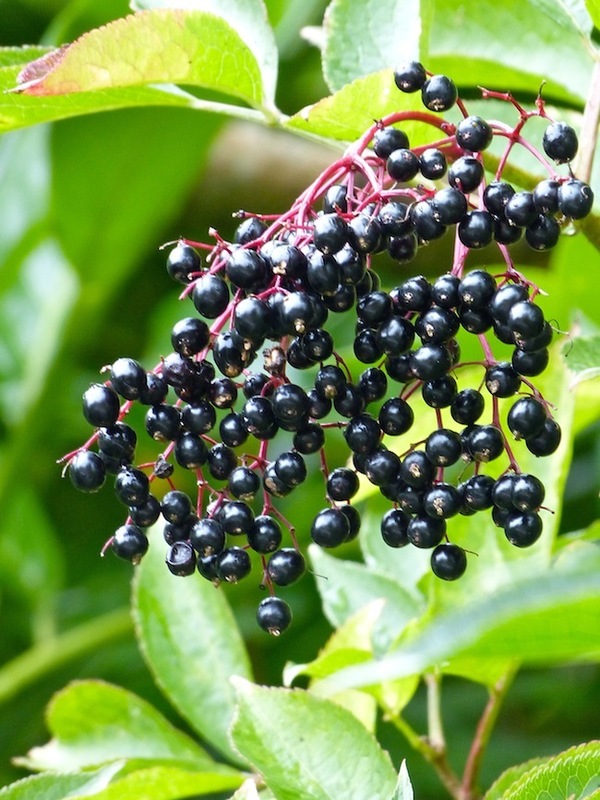 Collect bunches of ripe elderberries (Sambucus nigra), as many as you can find. Pick them, put them in a basket, and carry them home. At home, remove the berries from their stalks, discarding any that are past their best. The easiest way is to run a fork down the stalks. Put all the berries in a big bowl of water and swill around to remove any dust and bugs. Please note that the leaves and stems of this plant are considered toxic in the long-term, so don’t add them to your brew! A few tiny floret stems are fine, however. Place the berries in a large pan and add just enough water to cover comfortably. Bring slowly to the boil, then simmer gently for 15 minutes. Stir from time to time. Strain into a large bowl through a colander with a muslin cloth draped over it. Press the cloth with the back of a large spoon to get as much of the juice out as possible. Be careful about spills: this liquid stains! Measure the amount of liquid you have and put it back in the rinsed out pan. Add half a kilo (1 lb) granulated sugar for each generous litre (1.5 pints) of liquid. Heat gently until all the sugar is dissolved. While you are doing this, you might like to add the juice of a couple of mandarins (or an orange or lemon) per litre (1.5 pints) of liquid. Pour the liquid into sterilized bottles (putting them through the dishwasher beforehand is fine). Put caps on the bottles, making sure they are well sealed. Label and put in the fridge. (You can also freeze your cordial, but make sure you use plastic bottles and leave enough room in each bottle for the juice to expand when it freezes). Your elderberry cordial will keep all through the winter, until early spring, in the fridge (actually, mine can keep for up to a year, in a cool cupboard). Dilute with water to drink – a ratio of 1 juice to around 5 or 6 water depending on your taste. You can also drink it with sparkling water, or white wine, or even champagne. And it’s wonderful diluted with hot water to chase away winter chills. There is something magical about gathering Mother Nature’s wild fruits, preserving them, and drinking them. You will find nothing so vibrant, in any shop. You’re connecting with nature, and your true nature. The medicine is in the making. And the finished product has a healing quality all of its own. We are busy gathering elderflowers for cordial right now. The fragrant flowers are all around us in the hedgerows, and easy to collect. Each head is a frothy summer’s bowl of wellbeing. Elderflowers have been used for centuries for their health benefits. 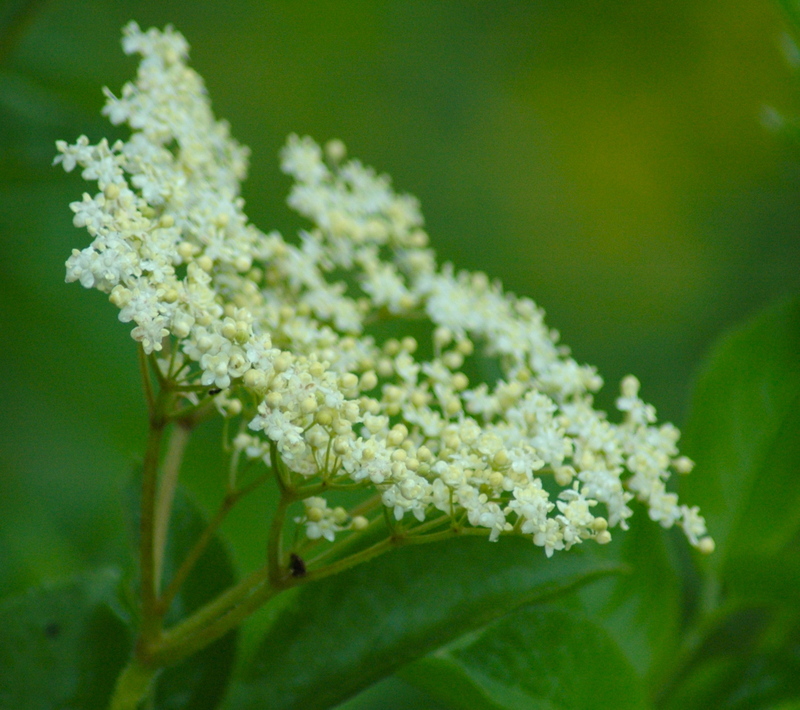 Elderflower water is mildly astringent and has traditionally been valued for the complexion. Make your own fresh elderflower toner by steeping a head or two of the fresh flowers – remove the pungent stalks first – in half a cup of boiled water, then straining. Apply on cotton wool, or spritz on to your skin. You can use it over a couple of days if kept in the fridge. 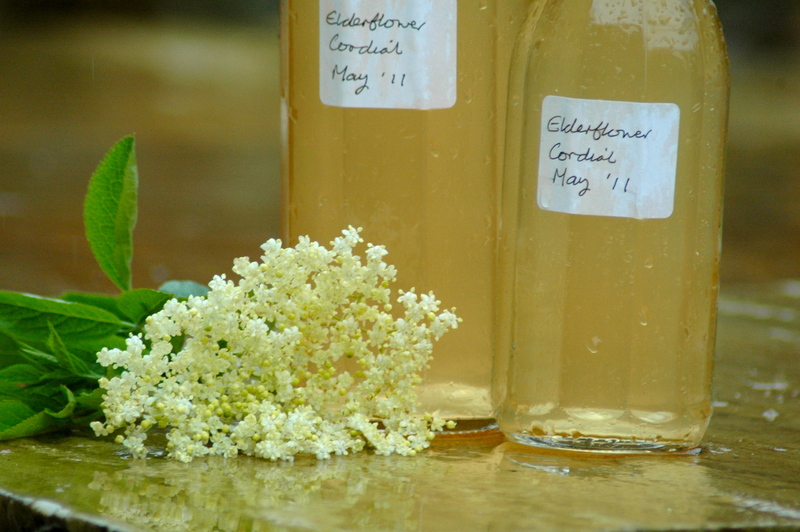 Elderflower cordial is an uplifting summer tonic – delicious with still or sparkling water on a hot summer’s day. If you have a cold or flu or feel run down, a hot drink of it in the evening is comforting and healing. Elderflowers are diaphoretic – they help the body during a fever by inducing sweating. The recipe: we take around 25 elderflower heads, with the stalks removed, and add them to a big bowl in which 1.3 kg of sugar have been dissolved in 1.8 litres of just boiled water. We add a couples of lemons, sliced, and a couple of oranges (or limes, for a more sharply refreshing summer drink). We mix the whole thing up, cover and leave for 24 hours. After 24 hours, strain the liquid through a muslin cloth. It’s ok to give the cloth a good squeeze to get out more of the juices. Then decant into clean, sterile bottles (You can sterilise bottles by putting them through a dishwasher, or by gently simmering in a big pan of water.) The cordial will keep for at least a month in the fridge. I have kept it for up to six months, though it usually gets drunk long before that! You can also pour it into washed plastic bottles – leave space at the top as it will expand once frozen – and store it in the freezer. We also gather the flowers to make herbal tea, which has all the health benefits of cordial, without the sugar. Discard the thick stalks, and leave the flower heads to dry. When dry, crumble the flower heads, discarding more stems as you spot them and place in an airtight container. This will keep for a year, until the next elderflower harvest. To make your tea, put one teaspoon of flowers in a cup of boiled water, brew for three to five minutes, then drink. You can add a slice of lemon or orange and maybe a spoonful of honey…. You can also make fresh elderflower tea by steeping some of the florets (without the thicker stalks) in hot water for around 5 minutes. Take one ripe mango, peel and chop. Add two dessert spoons of natural live bio yogurt. Add one teaspoon of natural unrefined caster sugar. Blend altogether. Add enough apple juice to achieve the right drinking consistency. Enjoy! Why it works: mango is a rich source of vitamins and minerals. It contains a generous supply of antioxidants including masses of Vitamin C as well as Vit A and skin-friendly Vit E, all of which can help to prevent disease and ageing. Another constituent, a triterpene called lupeol, has been shown to inhibit skin cancer. Yogurt, like mango, is rich in AHAs which are great at helping skin cells to renew themselves. A daily dose of live bio yogurt will also help to keep your insides healthy, which in turn will help your skin to glow. And the apple juice will deliver some more health-boosting anti-oxidants.